Raise your hand if you’re tired. I know I am. However, I should note that I did it to myself by staying up late last night watching a movie. I finally saw the first installment of Breaking Dawn. I didn’t have high expectations for the film, which was a good thing since it wasn’t that great. Does anyone know if part two is any better? Anyhoos, time for my Friday pub review. 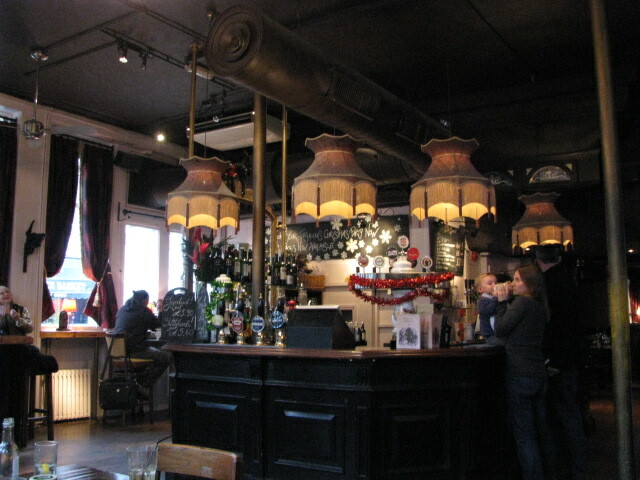 Here’s a pub I visited over the Christmas holidays in 2012. I know—this review is late. My apologies. Fortunately I was able to locate some photos. 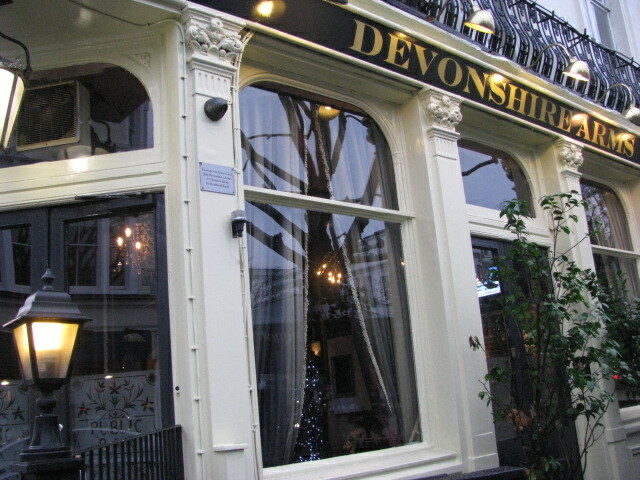 The Devonshire Arms, located in South Kensignton, is a place we like to pop into when we are heading over to the Hyde Park area of London. In the winter, we still walk to most of our destinations, and this gives us the perfect excuse to stop to warm up. In the summer the excuse is to have a drink to cool off. I need to come up with a couple of excuses for spring and fall. Let me know if you have any. One of the main attractions of this pub, for me, is the heated beer garden. I love being outside. And I love being warm. Even on a cold night last December I was pretty comfortable. There are several lagers on tap and they change the ales on a regular basis. This is perfect for me since I love to sample new tipples. When I moved to London I was pleased that pubs serve half pints. It’s a great way to find out if you like a beer without committing to a pint. And some pubs will supply a small taster before you even decide if you want a half pint or pint. If I’m trying a new beer I stick to a half pint. I never know if the flavor will get to be too much. 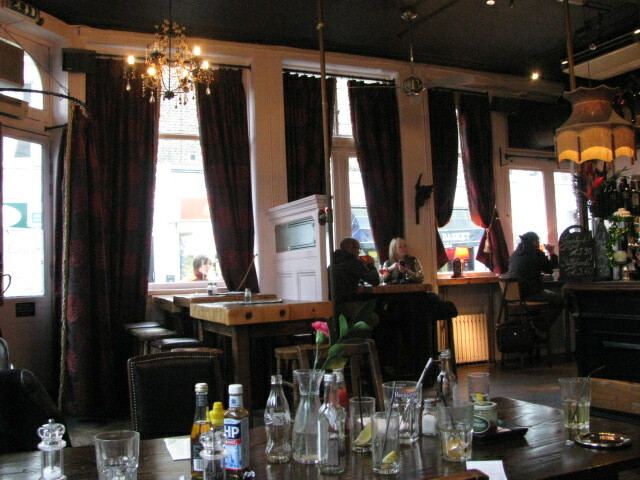 Inside the pub is cozy. On one occasion we just missed the Saturday brunch. We didn’t eat, but from the looks of it, it’s a popular spot. When we walk by this place during the summer, the outdoor area is usually packed on Saturdays and Sundays. Always a good sign for me. I remember going into this pub on two occasions at least, and each time the staff was friendly. 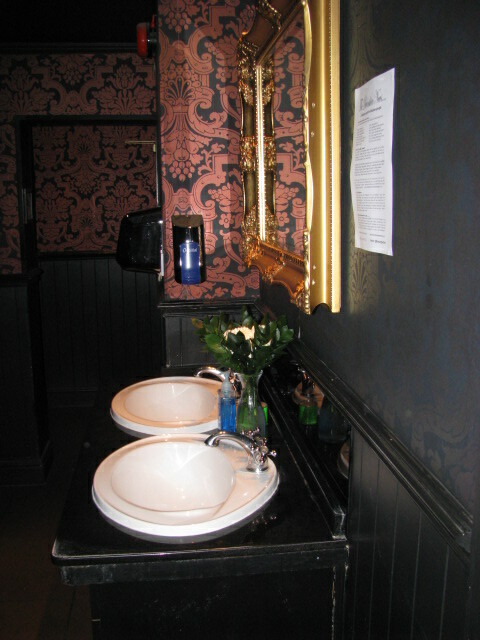 The bathroom was spotless, and the beer was fresh. 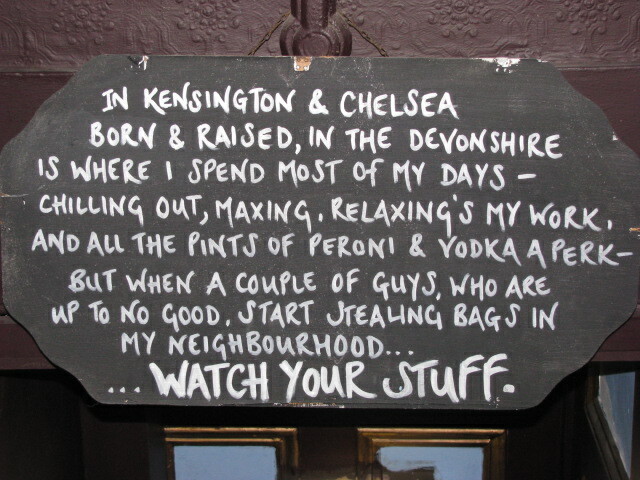 What more could you want from a pub. Well, maybe I’ll try the food at some point. The pork & chorizo burger with caramelized red onion sounds pretty tasty. And they have a salted caramel & chocolate tart with clotted cream. Come to think of it, I don’t have any plans this evening. I love a place that has a sense of humor. 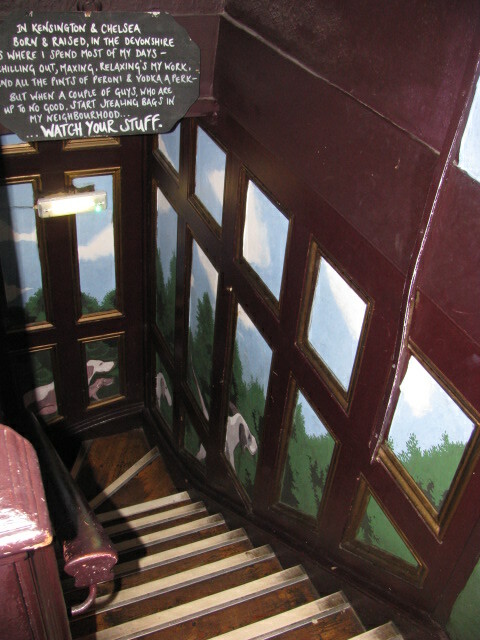 This entry was posted in Pub of the Week and tagged 50 Year Project, Blog, Blogging, Breaking Dawn, England, English Culture, English Pubs, English Traditions, Hyde Park, Kensington, Life, London, Photography, Photos, Pubs, Pubs in London, South Kensington, Travel, Travel Blog, Travel Journal, Travel Photos, Twilight Movies, Twilight Saga. Bookmark the permalink. My first pub stop in some time. The burger sounds very tempting, and cheers to the half pints. Enjoy your Friday. I hope you had a wonderful weekend Frank! Looks like a fun pub. As for the Twilight series…It’s no Harry Potter. Yeah, I was sad when the Harry Potter series ended. Such a good one. Loathe as I am to admit it, Breaking Dawn Part Two was pretty good! There are plenty of action scenes, so that made me smile. Thanks Hook, good to know. That’s a nice pub! I didn’t realize pubs had outdoor heaters or Sunday brunch. Just can’t do the Twilight series, but I hear it’s addictive. Not all pubs have heat outside, but some do. It’s actually nice to be able to sit outside year round. I have not seen any of the Twilight films – though I have read the books. I do admit to being a bit bored with the story once I had begun the third book. Dear Bella, she cannot make up her mind and it got a bit tedious after a while. Therefore I would not be surprised to find the film would reflect that. It sounds perfect, can’t do beer though except in hot countries! Really nice pub! And you know they say clean restrooms, excellent place to eat!! Okay, I must admit I love the Twilight series, a lot! It is addictive! I am a fan of the Twilight series–even read all the books. Looks posh! Breaking Dawn II: I’d pass…. I love that sign! Totally cracked me up. It got a chuckle out of me. I didn’t think that much of it either. I’m not sure which ones I have seen and which ones I haven’t. I love that you took a photo of the bathroom 🙂 Very thorough review! I was very happy that no one walked into the bathroom while I was snapping the photo. how fun. i love the heated garden. what a nice way to spend a friday afternoon. 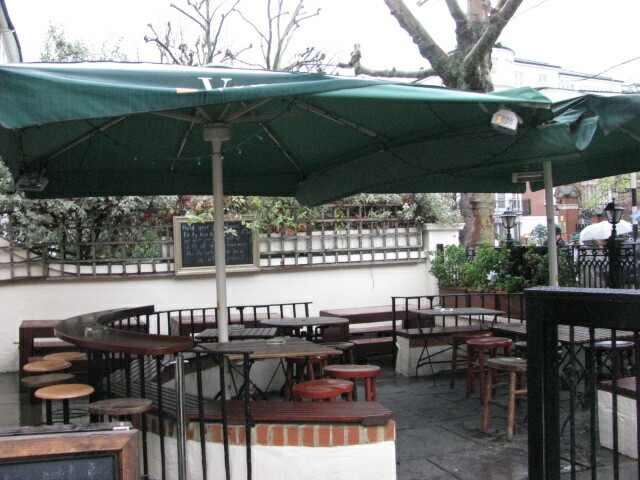 A heated beer garden sounds nice! And it’s in a posh neighborhood.